Imagine you could buy a e-book that told you everything you need to know about Cuenca, Ecuador. And the book included information about the city of Cuenca, Ecuador the country, immigration, cost of living, and pretty much everything else you might want to know. Then imagine the E-book included interviews with the top real estate companies in Cuenca. So not only would you know about Cuenca. You would also have the resources to take action. You can do all of this in the next 30 minutes. What are you waiting for? Who This Book Is For Are you considering moving or retiring or investing in Cuenca, Ecuador? 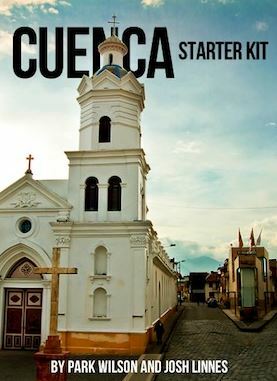 Or do you just want to learn more about Cuenca right this minute?Then the starter kit is for you.Just want to learn a little more. When you you are considering another place to live you want information. You need to decide if this is a pipe dream or a real alternative.How do you do that when it’s in a place you’ve never been to? Well, it’s pretty simple really. 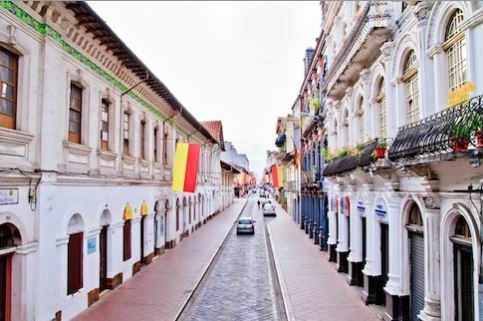 First you need to make sure Cuenca is worth a visit.You can do this by researching, sending emails, and reading forums. But this is time consuming and hard to verify.I’m planning a visit. Will the Cuenca Starter Kit help me?I spent a month in Ecuador last year making the contacts and getting the lay of the land. I met with over 15 law firms to understand the playing field. I drove 3,500 kilometers, turning the country upside down to find the good, the bad, and the ugly.And you can benefit from that now for a heck of a lot less than it cost me.So yeah. With the Cuenca Starter Kit, you’ll learn what I learned. I’ll share my contacts with you. Names, phone numbers, and email addresses.And finally, I’ll give you a plan of action so that your trip is guaranteed to be better. The Cuenca Starter Kit covers everything from how to get to Cuenca from the airport all the way up to how to get the biggest bang for your real estate buck. We’ve addressed topics that help you understand what your life in Cuenca would be like. Things like the average temperatures and how much you can expect to spend in a month. We’ve also hit on some of the meatier stuff like what your residency options are and how to go about finding a qualified attorney. Most importantly, we’ve detailed what we feel are the best (and the worst) reasons to consider relocating to Cuenca. The information provided is based on our research, as well as a lot of our own hands-on experience with these processes.